Proud moment. I got the same medal as Nina! So this is it folks, I have completed all my challenges for 2018 and am on a wind down for the rest of the year, before I start all over again in 2019. Not so many challenges next year – it’s not that I don’t want to, it is more that my bank balance will not allow me! I am finishing my blogs and the year with possibly one of the best experiences I have had to date. The NEW YORK MARATHON. What an absolutely amazing, challenging adventure this was and the best way for me to end what has been a life-changing year. On 1st November I flew down to London once again and met up with 3 of my Walk the Walk sisters. I had met Julie before and she knew the others Christine and Lesley, so we had already bonded over Messenger and made a list of all we wanted to achieve in New York. The time was so short that we needed to be organised to make the most of our amazing trip. I was sharing a room with Lesley so it was great to meet her the night before and begin to get to know each other better. The New York Marathon is where Walk the Walk came to life. Nina Barough – Chief Executive and Founder - walked the New York Marathon in a bra with 12 other women in 1996 to help raise money in the fight against breast cancer. Only 2 months later was diagnosed with this disease herself. Nina dreamt of walking the marathon in her bra – literally had a dream about doing this. From this time Nina has inspired thousands of woman and men to walk in decorated bras through the streets of many capital cities and trek mountains, the Arctic and see the most magnificent places on earth. And every year this number grows as more and more people are affected by breast cancer. Nina was already in New York and had registered all of us for the 5km Dash to the Finish Line on the Saturday. After meeting Nina, having a well needed hug with her and getting our race numbers, we headed to Times Square. It was drizzling rain as we left the hotel, but it did not dampen my excitement at seeing with my own eyes these massive buildings, then the blinding lights of the advertising boards of Broadway and Times Square. We had only just got back to the hotel when the rain really started. Boy when it rains in New York, it really rains. After an amazing sleep we were up early and off the United Nations Building for the start of the 5km Dash. To get there we walked past Rockefeller Centre, Saks 5th Avenue, Madison Avenue and Park Avenue. This was the first time I have heard the U.S. National Anthem in person and that was enough to start a few tears. It is so powerful to be in a country and hear their national anthem sang by thousands. The 5km dash took us along the streets of New York to Central Park where we finished at the finish line of the Marathon. It was wonderful to walk along there knowing that the next time I walked along here I would be finishing the New York Marathon. There were so many people taking part in this event, people of all ages and nationalities. There were 14 of us completing the challenge for Walk the Walk. This was the first time the decorated bras were given an airing and we quickly became the focus of people’s attention. There were people queuing to have their photos taken with us. Once the 5km was over we all went to one of Nina’s favourite places for breakfast. We had to sit separately as it was so busy. A few of us were sat on a long table with a number of United Nations workers. As the bakery was busy the staff were working very hard and a few mistakes were made. There was something very ironic about United Nations Peacekeepers (I spoke to them to ask about their jobs) having a go at the overworked waiter as their coffee had not been delivered. And someone got locked in the toilet so the Police and Fire Brigade had to come and rescue the poor man. After breakfast we headed to the Expo to get our numbers for the main event. Again we were stopped a number of times as we had our Bra T-shirts on. Our little group of 4 gave an interview for a College Magazine, showed off our bras repeatedly and agreed to do a boomerang Instagram post for World Marathon Majors. It took us so long to get around the Expo that we managed to get back to the Hotel just in time for a shower before we had our Tactics Talk and Pasta Party. So with not a lot of sleep, even with an extra hour as the clocks went back, I woke on Sunday morning and the first thing I did was have a little cry. The nerves were really hitting me and again the negative thoughts crept in. I was nervous about being in such a big group of people but also that I would be one of the last to cross the finish line, that it would be dark when I finished and what it would be like to walk through the streets of 5 boroughs of New York. Lesley was amazing as we tried to calm each other down. Lesley was running the Marathon and was equally nervous about getting round. She was well prepared and we had a good talk about how some of the miles would be slower as they were uphill over the bridges. We went by bus over to Staten Island. I am a massive Sopranos fan so when we came to the New Jersey Turnpike, I was very excited, to go along with the nerves. I sang the theme tune in my head to try and steady myself. I know what a massive event the Marathon is but I had not really comprehended that so many of the emergency services are needed to protect us. The roads are all closed to allow us to walk, jog, and run. In order to do this, the Refuse Trucks are used to block the road. This was quite a sight as they strategically park to block the road and protect all of us. Once in Fort Worth we were split in to our different groups of start time. Since signing up for this challenge I had been informed how cold it can be on Staten Island waiting to start. We leave the hotel at 6.30am, but do not start walking until 11am. We had been told to take lots of clothes to keep us warm that we can then take off before we start. All the clothes left behind are then donated to the homeless charities in the city. What no one anticipated was that it was actually a really warm day. To the point that I had sunburn on my back!!! When it was our time to start, we were lucky that we started on the Upper Part of Verrazzano – Narrows Bridge. We were level with the Tank that fired the gun to start us. Again the National Anthem was sung. This was even more powerful, as all the soldiers, police and volunteers stood, removed their hats and stood to attention. Once the gun was fired we felt the backdraft of this on our backs – that was very powerful. And we were off. The bridges of New York are very curved so the first mile was uphill to the top of the bridge. That was tough for me, as I need a few miles to get the legs warmed up. I watched as my fellow Walk the Walkers headed off and I wished them all well with promises to meet in the hotel bar later. The atmosphere was electric and the nerves were replaced with a constant grin as people congratulated us for walking in a bra and for raising awareness of Breast Cancer. After coming over the bridge I entered Brooklyn. People come out of their homes and are cheering you on with shouts, music and general good banter. Every borough claims to be the best one and welcomes you to their area. The Police also welcome you but tell you to ‘get the hell outta here’ with a massive smile on their faces. To see the Police and Fire personnel keeping an eye on us all was a humbling experience. The Marathon takes you from Staten Island through Brooklyn, Queens, Bronx and Manhattan, finishing in Central Park. For the first time ever, I was asked to be the pace maker for another Walk the Walker and a runner who was struggling from mile 5. It was great confidence boost that I was helping someone achieve a goal after all the support I have had this year to achieve my goals. My Walk the Walk sisters Carol and Sam were considering the Berlin Marathon, so wanted to try for a good time. With all my training this year I felt I could achieve the elusive 6hr 30 min marathon. I had my pacer band on that the amazing Elizabeth Gibson had made for me. After mile 3, I was behind but I was happy and Carol was keeping me going with getting to know each other. As the miles went by I knew I would not make 6.5hrs but was hopeful for 6hr 40mins. I tried to keep a steady pace while Carol slowed then sped up to catch me once again. Carol was able to do this until Mile 18, then she dropped back. I had to keep going as it was getting chilly being surrounded by the tall buildings with the sun beginning to set. 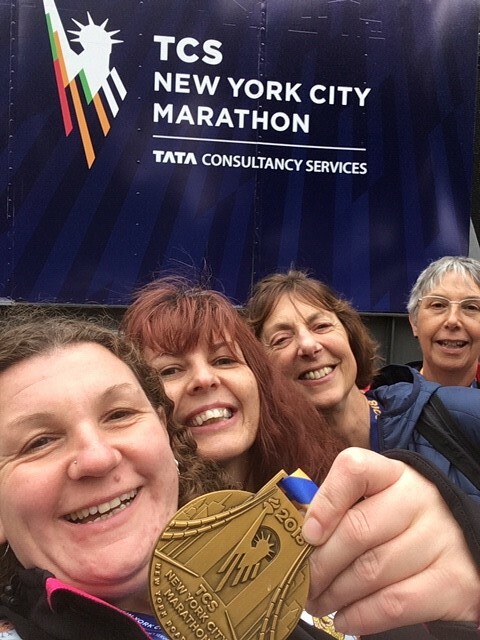 At Mile 23 the Police car came past to say the Sweeper bus was one mile behind us – 15 minutes – and that if it caught us we had to either get on it or walk on the pavement. I was one mile away from Central Park and knew there was no way the sweeper bus was catching me. It was dark by then and I was cold, but I was determined that I would finish in my bra having walked this far without the need for my jacket. Throughout the route my phone was buzzing, but I didn’t want to check it and waste time. I knew some of my Walk the Walk family were tracking me and that the buzzing was another message from one of them telling me to keep going. As I crossed the finish line in the dark on my own, I couldn’t laugh or cry as I was numb with the emotion of finishing. Once over the line with my medal round my neck I put on my jacket and tried to warm up. Nina had opted for all of us to have the poncho when we finished. This was a fleece lined jacket and it was so welcome to have a hug from the lady who gave me my poncho. I then looked at my phone to see my finish time was 6 hours 49mins. This is my best time for a Marathon, but at that moment I was totally gutted as I so wanted 6.5hrs. I had consoled myself that I wasn’t getting that, but thought I was on for 6hr 40min, so to come in just under 10mins later than that I felt deflated and frustrated. I was blessed as Christine and Julie had waited for me to finish. I so needed to see someone at that point and we had a good natter as we walked back to the hotel. It was amazing to see how many people congratulate you as you walk back to the hotel. I needed to hear that and my initial disappointment changed to pride. I was tired and had a sore back – I didn’t realise at that point my back was sunburnt. But was I thankful as my feet were blister free and not sore at all. When I got back to the room Lesley was waiting with a massive hug and a cup of tea. We talked through our experience of the route. We were both happy and sad at some points and it was good to talk this through. After a shower it was time to celebrate. 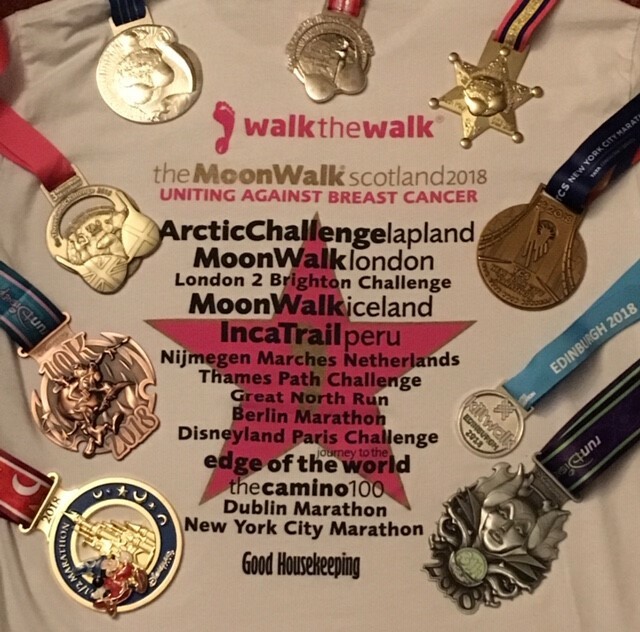 On the Monday morning I read through all my messages and I was overwhelmed by the messages of support and encouragement I received from all my Walk the Walk family. We truly love and respect each other and you will never be alone once you join Walk the Walk. The final ‘formal’ WTW part of the weekend is breakfast at Ellen’s Diner. All the waiting staff are actors waiting for their big break on Broadway. They sing to you while you eat and you get a show with your meal. Our group of 4 then headed off to explore the city. We made our way with a few detours to Grand Central Station. It is truly as amazing as it looks in films. The fabulous four had chosen to see a Broadway show on the Monday so we got all dressed up, headed to the Rockefeller Centre for a drink in the Rainbow Room. This was a bar on the 65th Floor of the Rockefeller Centre which overlooks the Empire State Building. After a cocktail we headed to Broadway to see School of Rock. This was an amazing way to celebrate walking a Marathon and the show was inspiring. The children play the instruments themselves and they were absolutely fantastic. As we only had one day left we got up early on Tuesday and made our way to an open top bus tour. For me there was one place I absolutely had to go as it was somewhere that had touched my heart for many years – Ground Zero. Julie had been before and knew me so she knew how to prepare me. As we walked down the road she quietly said to me we were about to arrive. It was raining so we all had our hoods up. As I walked down I saw the edge of the memorial pool of North Tower, the reality of where I was, what I had achieved and what had happened on this spot hit me and the tears came in one huge wave. We all took time to walk alone around the North Tower Pool then went in to the Museum. This was a very emotional place with some of the original building still standing, so many artefacts from that fateful day. I won’t spoil it for anyone who wishes to go, but it is a real wake up call to the destruction that can be caused. At the beginning of the tour there was a hushed silence and respectfulness, but by the end it was busy and I was ashamed that I wanted to get out and did not take on board the most important part of the museum - a minute by minute display of what happened on Sept 11th 2001 – as I was so overwhelmed by everything and could not handle the noise any more. From there we needed to get back to the hotel to get the bus to the airport. We did not have time to go on the Staten Island ferry and see the Statue of Liberty, but that means I need to go back to New York again and maybe even do the marathon again. So my walking journey for 2018 has come to the end. Taking part in the #1000 mile challenge has kept me focused throughout the year and when the weather was rubbish, it made me bite the bullet and use a treadmill to walk. I have loved doing this challenge alongside my Walk the Walk challenges. I need to thank Guy at Country Walking for indulging me to lay all my ups and downs of the year into words. This has been very therapeutic to write down how I have felt. I may keep doing this for my own diary. I also want to thank Jen at Walk the Walk for asking me to write these blogs. I loved walking and talking with you. Thank you to all my Walk the Walk family for supporting and encouraging me over the last 2 years. You are all awesome people and my life would not be this happy without all of you in it. And to my family and friends who support and indulge me when I tell them where I am jetting off to next. So I’m signing off now for the final time. Raise money, Raise awareness, Get Fit and Have Fun!